Installation view of the exhibition True to Self. The Paisaje de rombos series is displayed in a horizontal backlit case. 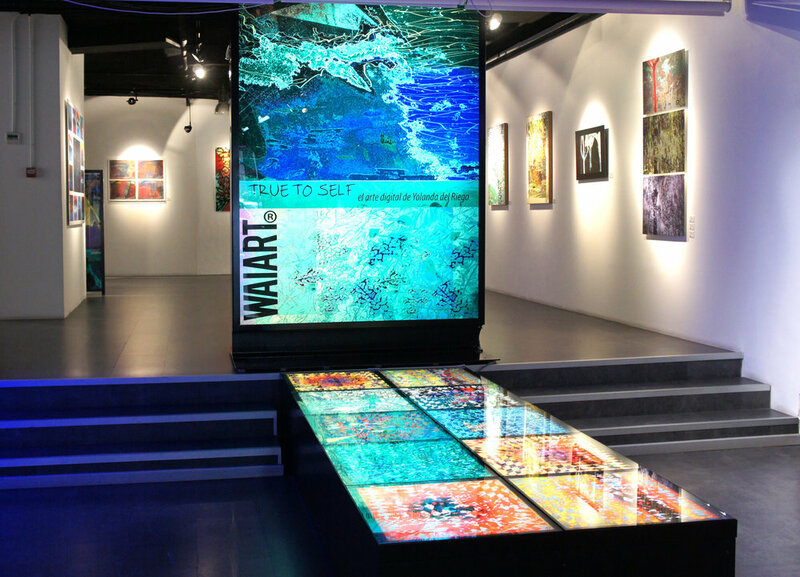 Exhibition: True to Self. The Digital Artworks of Yolanda del Riego. A selection of over 45 artworks by Yolanda del Riego (YR) created solely using digital tools and technologies, exhibited alongside previous works in other mediums (etchings, patchworks, ink drawing) to demonstrate how Yolanda del Riego remains true to the visual language with which she has expressed herself throughout the last four decades. YR exhibited her first digital works in the mid-2000s and by the end of the decade was working almost exclusively with digital tools, producing mostly inkjet prints and some C-Prints. In 2012, she began experimenting with other digital printing methods (like direct-to-substrate printing) and supports (Dibond, textile, backlit displays), as well as with larger formats. Through the works in this exhibition, developed between the end of 2011 and the beginning of 2013, we can trace YR’s experimentation process along with her exploration of new ways to create interactions between her digital images and their underlying supports.